The Stari Grad Plain is an agricultural landscape of vineyards and olive trees that has been in continuous use since Greek Antiquity. The farming land on the island of Hvar is divided into regular-sized parcels, which are called chora. 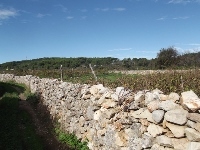 Their authentic dry stone walls mark the boundaries between the individual parcels. Also, little beehive-shaped sheds (for storage of tooling) and cisterns were constructed. These methods were introduced to Hvar by Greeks from the island of Pharos, who colonized the area in the 4th century BCE. The Greeks also founded a town, Paros (now Stari Grad). The historic part of the city of Stari Grad is part of the core world heritage area too, although the remaining evidence of the Greek period is limited here. While on the ferry between Split and Stari Grad, the thought struck me that the Croatian Tourism Board must have a large say in which sites are nominated as Croatian WHS. Remarkably, all sites that got in so far are conveniently close to the popular Adriatic coast. No inland prehistoric settlement or derelict mines have shown up on Croatia's shortlist. The 2008 nomination of the Stari Grad Plain is no different: its designation is the result of clever labelling (cultural landscape / vineyards). 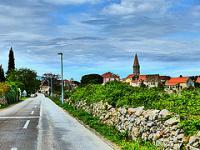 The main aim however seems to attract even more tourists to the holiday island of Hvar. And especially push tourism to the town of Stari Grad - hence the site's name 'Stari Grad Plain' (where it easily could have been 'Agricultural Landscape of ancient Paros'). It took me 1 hour and 45 minutes by boat to get to Stari Grad. This was on a large car ferry, with hundreds of people on it. Fortunately everyone went their own way after arriving, and I walked along the shore to Stari Grad town in about 20 minutes. This is a pleasant little town with an abundancy of restaurants, bars and souvenir shops. Its old town has been preserved quite well and warrants roaming around for an hour or so. There's a tiny local museum at the Dominican convent, where Roman coins and an ancient wine press are on show. Of course I had to have a look at the Plain too. I rented a bicycle at one of the many shops in town, and just rode eastwards out of town. But where to look? This site is much like the Beemster Polder, where the land is all around you but there still is not much to see. And while it's called a 'plain', it isn't flat at all. After an hour or so, snapping a photo here and there of stone walls, grapes and olives, I decided to turn in my bike. Better to use a scooter here! The Greek colonists from Paros have set up this agricultural divisions with stone walls,and small stone shelders (so called trims), and it all dates back to the 4th century BC.For the past 24 centuries nothing has much changed here, and the perfect geometrical land distribution is still intact here, best seen probably from a plane; but we rented a bike, and the site starts just outside of the lovely town of Stari Grad, so easy to reach, even by foot.The site can easily be visited on a day or even half day trip from Split with good boat connections back and for. I visited this WHS in April 2014 by ferry boat from Split. I took the slow ferry since I decided to go by car for the day. The catamaran service takes 1hr instead of 1hr 45mins but it inly carries passengers and its schedule is only convenient if you intend to sleep on Hvar island. I had a fabulous hotel room in Split so I took the slow ferry departing from Split at 08:30 and coming back from Hvar island at 17:30. If you travel by car, make sure you're waiting at the jetty at least 1 hour before otherwise you risk not finding a space. The ferry trip was smooth and we passed by Brac island before arriving at Hvar island. The view of Split from the higher deck is worth seeing too. The ferry arrives at Stari Grad harbour which is 5-10minutes by car from Stari Grad Old Town. There's a free parking lot just outside the town which is where I left my car. The old town itself has UNESCO funded information boards illustrating the things to look out for and giving a brief overview of the historic importance and cultural value of the site. The whole loop took around an hour in which I saw some mosaics, a couple of chapels and churches, hill forts, a medieval tower and a mill. Skor Square and the Church of St. Stephen were the highlights of the old town. Then I drove in the narrow country roads with rubble walls, olive trees and vineyards to different viewpoints and I must say that the highlight there was the panoramic view of countless vineyards and lavender fields on rolling hills going down towards the blue sea in Brusje. Afterwards I drove to the other side of the island about 30 minutes away on a well-paved winding road to Hvar Old Town. It turned out to be a worthwhile trip since it was still low season and still quiet compared to the summer months when this place is overcrowded with people wanting to enjoy the beach or the summer parties. Hvar's 16th century Venetian-era hilltop castle offers fantastic views of the harbour below. The highlight of our trip to Hvar was undoubtedly the fresh "seafood buzara" we ate at Gariful, a chic restaurant along the waterfront. On disembarking from the ferry at Stari Grad harbour I found two buses, one headed for Stari Grad town, the other for Jelsa. So I took the latter and travelled throught the plain, passing through the villages of Dol and Vrbanj en route. Jelsa was a slightly larger village clustered around an attractive harbour. 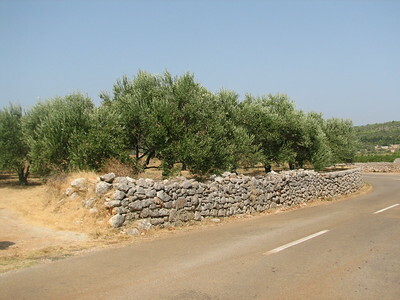 Walking out of the back of the town I soon came to vinyards and olive groves with the signature stone walls. The scene was a hive of activity as the olive harvest was in full swing. I returned to Stari Grad town by bus and walked through the narrow streets and squares to the waterfront. Being November it was a ghost town, just a few individuals at a bar. I then enjoyed the walk around the coast to the ferry terminal. Ancient Greek colonies: "Beginning in the 4th century BCE, the Greeks colonized the island." Built in the 4th century BC: "land parcel system, dating from the 4th century BC"